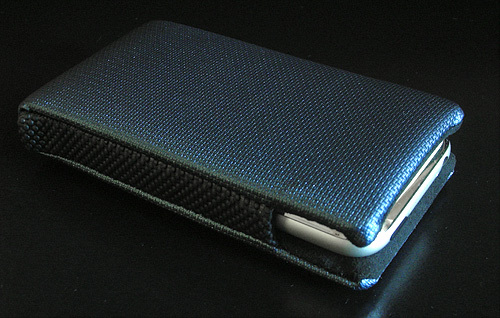 OhGizmo Review – WaterField Designs iPhone Cases | OhGizmo! It’s no secret that I’m the type of person who takes very good care of their gadgets and while at times it might border on paranoia in the end it usually pays off when I get bored with the device and want to sell it for a decent return. It’s also no secret that while the iPhone was one of the most anticipated gadgets to come along since the invention of gadget blogs it’s also turned out to be one of the most fingerprint prone devices I’ve ever touched. So even before I asked the salesperson at the Apple store if they had any iPhones in stock I first made sure they had screen protectors available since I had no intentions of even touching the phone until it was properly protected. While at the Apple Store I was also tempted to buy a protective case for the phone but being a fan of WaterField Designs I figured I would wait and see what they were cooking up instead. Thankfully after only a brief wait the company released their iPhone Smart Case and iPhone Suede Jacket Case which I had the opportunity to take a look at. If you’ve been in the market for a case for your iPhone and haven’t been that impressed with what’s available at the Apple stores you can check out my full review of WaterField Designs’ offerings after the jump. Between the two iPhone cases that WaterField Designs (or WF) is currently selling the Smart Case is definitely the one to go for if you’re looking for any kind of protection for the phone. The Suede Jacket case which you can read about below is really only designed for protecting the iPhone from fingerprints and scratches. As you can see the Smart Case has a clean and simple design which is definitely the most important thing I look for when it comes to choosing a case for any of my electronics. In my opinion it defeats the purpose of buying a sleek and slim device when you put it in a large case that adds a lot of bulk. And even though I like carrying all my electronics in some sort of case I prefer using them naked so the WF Smart Case is perfect in that regard since you can’t actually use the iPhone while it’s inside. 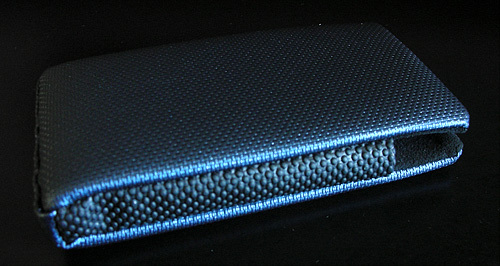 The Smart Case I was sent came in a blue color but it’s also available in black, brown, green, red and silver finishes. I’ll also mention that the colors used are very muted so don’t worry about ending up with something that looks too ‘loud’ because they’re all very tasteful. The top and bottom of the WF Smart Case is covered in a uniquely textured material that is actually smooth to the touch and gives the case a distinct look. 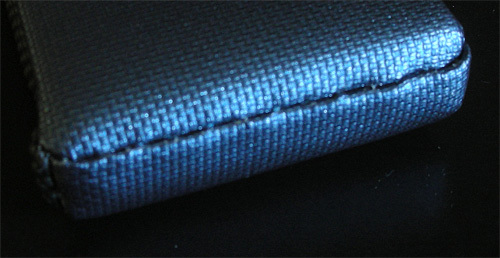 On the sides of the case you’ll also notice they’ve used a soft rubber material that’s covered in small bumps. Not only does this provide a secure grip when holding the case but it’s also quite useful when removing the iPhone since like I’ll mention later the case provides a very snug fit for the phone. Like with everything else WaterField Designs makes the finish on the Smart Case is impeccable and the only place you’ll find a trace of stitching is a seam across the bottom that’s finished in such a way that most people will never notice it. In the past when reviewing bags and cases I’ve also made mention of any branding or logos they have since I’m really not a fan of being a walking billboard. Thankfully neither of the WF iPhone cases have any kind of branding whatsoever. It’s nice of the company to simply let their design stylings and high quality product speak for them rather than a corporate insignia. In terms of thickness the case is just under an inch ‘thin’ and while that’s considerably thicker than the iPhone itself it’s actually a good thing because that extra thickness is a result of the case’s padding. In addition to a rigid insert that gives the case some stiffness there’s also maybe a quarter inch of foam on each side that provides some much needed cushioning. And while you can’t really tell in this photo the inside of the case is lined with scratch-free Ultra-suede that will not only keep your iPhone safe from scratches but will also serve to polish off fingerprints everytime it’s inserted or removed. Here you can see a comparison between the iPhone and the Smart Case that also gives you a better idea of how much thicker the case is compared to the phone. When the iPhone is inserted in the Smart Case it’s pretty much completely protected except for the edges of the phone at the top as you can see here. And this is probably my only concern with the Smart Case. Typically my gadgets always end up banging around against each other while in my shoulder bag and that’s the primary reason why I tend to carry everything in a case. So while the iPhone is mostly protected in the WF Smart Case there’s still a chance for loose pens, coins or even my keys to scratch the edges. But at the same time I can understand the reasoning for these parts of the iPhone to remain exposed since they help you easily remove the phone from the case. You see the iPhone fits very snugly inside the Smart Case and at times it can actually be a bit difficult to remove even with the rubberized edges providing an extra bit of grip. But it’s definitely not something I would complain about since I’d much rather have a snug fit with no chance of the iPhone falling out than a loose fit and worry about what could happen if I’m not careful. Like I mentioned earlier if you like to use your phone while it’s in a protective case then the WF Smart Case is not for you. As you can see here while the headphone jack and lock/power button are still accessible you don’t have access to both volume buttons making even listening to MP3s while the phone is in the case very difficult. But fortunately the mute switch (not pictured) is still accessible allowing you to quickly silence the phone as needed without having to first remove it from the case. Everyone has their own specific wants and needs when it comes to protecting their toys and if simplicity ranks high on your list then the WaterField Designs Smart Case is a good choice. It provides almost complete protection for the phone particularly if you’re worried about the phone being banged around while it’s in a larger bag. I’ll also mention that while they’re not pictured the Smart Case also comes in two other versions that include either velcro flaps on the back for securing the case to a shoulder strap or a belt clip if you prefer the phone to be hanging from your waist and easily accessible. + Well made with high-quality materials and minimal visible stitching. + Ultra-suede lining will not only protect the iPhone from scratches but can also serve to clean off fingerprints. + Extra padding will protect your phone against the occasional bump. + No logos or branding anywhere on the case. – Some might not like the particularly snug fit. 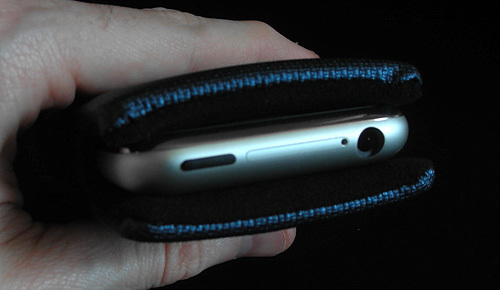 – The extra padding does add a bit of bulk to the iPhone while it’s in the case. – The top edges of the iPhone remain exposed and could get scratched depending on where you carry it. – The phone has to be removed from the case to be used. Where as the WaterField Designs Smart Case was designed to protect your iPhone with a little bit of padding and extra bulk the Suede Jacket Case takes the opposite approach and as far as I can tell is the thinnest case you can buy for the iPhone and will really only protect it from scratches and fingerprints. 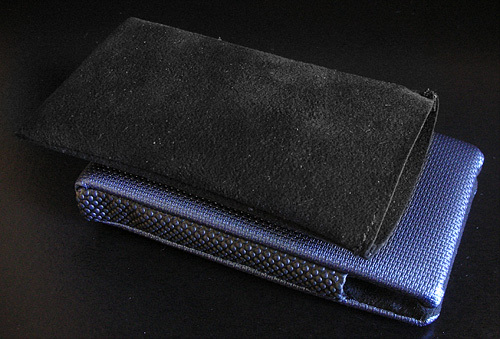 It’s basically nothing more than an iPhone sized Ultra-suede bag that completely covers the phone while it’s inside. And while the WF Smart Case is relatively thin it still adds enough bulk that I wouldn’t use it to carry the iPhone in my pocket. However the Suede Jacket Case is absolutely perfect for this. As you can see in the photo it’s pretty much the same size as the Smart Case except when it comes to thickness. As for color choices the Suede Jacket Case comes in either black, black, black, or black so if you always have trouble choosing the color you like that won’t be a problem here. Finally, while the Smart Case provided a very snug fit because of the extra padding the Suede Jacket Case is pretty much a perfect fit and inserting and removing the iPhone is very easy. When fully inserted there’s about a quarter of an inch of extra fabric at the top but I would have maybe preferred a bit more that could be used as a foldover flap which would also help keep the phone free of dust and pocket lint. 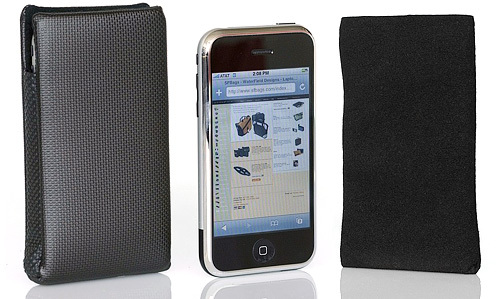 For me the Suede Jacket Case is a must have accessory when I’m carrying the iPhone in my pocket. Even if there’s nothing else in the pocket I just feel safer knowing there’s an extra layer of protection for the phone ‘just in case’. And at only $9 it’s a particularly cheap way to keep your iPhone looking as new as the day you waited 48 hours in line for. 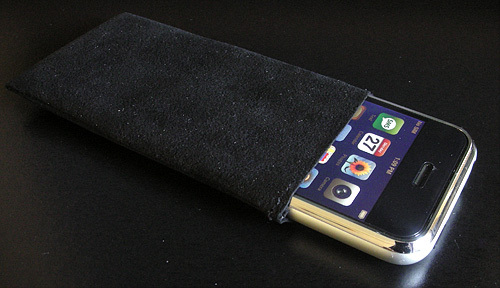 + Well made from soft Ultra-suede material that will never scratch the iPhone. + The Ultra-suede material also doubles as a polishing cloth. + Can actually be used for carrying other gadgets as well like an iPod or other PDA type phones. 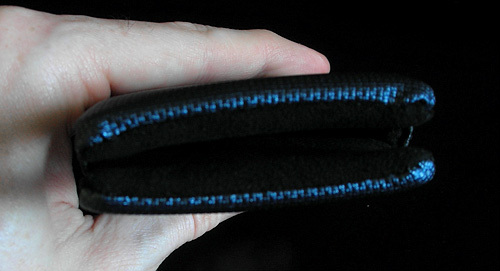 – Lack of padding means less protection for your fancy toy. – Some might prefer an extra bit of fabric at the top that can be used as a protective flap. If you have any further questions or concerns about the WaterField Designs iPhone Smart Case or Suede Jacket Case you’d like answered please feel free to leave them in the comments section and I’ll try to respond to them as best I can. Those cases don’t look all that original… although I guess cases really can’t be that exciting. I have other cases from Waterfield Designs and the quality is phenomenal. I’ll give these a try (as soon as I get my iPhone…). Can you tell me how they do when you pull the phone out of your jean's pocket. I've been looking at getting rid of the plastic shell I have on mine with something more fabric based, however some comments I've come across on some products say that the sleave will come off the phone as you try to take the phone out of your pocket. Nice case, will this work for HD video conferencing companies?